– “The Wayfarer,” Norwich Bulletin, June 25, 1910, page 14. In the late 19th century, Connecticut was highly regarded as a pioneering state for its expansive network of parks, playgrounds, and other spaces for recreation. Indeed, at one time, Bridgeport was known as “Park City” and Hartford was lauded as a striking example of a planned urban landscape. Though many in Connecticut had an especially keen interest in shaping the built environment and “natural” spaces in the state to better suit the peoples’ need for recreation, these efforts were also part of a larger national and international trend. In the late 19th century, urban reformers took to the streets, bringing children out of dangerous areas to make way for trolleys and eventually, cars. 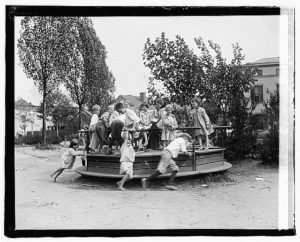 Through the development of playgrounds, ball fields, and parks, children’s play became a far more serious—and regulated—matter in the Progressive era. This was due, in part, to the rapid rise in immigration, to the continued boom in industrial work, and changing notions of who should be outside of the labor force. Fearing that children were working too much and/or not getting safe outlets for play, reformers expressed a heightened interest in channeling youth into structured areas and clubs. Particularly in cities, such as Bridgeport, maintaining a sense of innocence and time for play became imperative for city planners. This desire to mold and to a degree control recreational outlets was not just about what children were doing with their leisure time, but larger debates about the family and work. As the many articles written about play and playgrounds in Connecticut newspapers reveal, local residents were not always entirely pleased by where playgrounds and parks were situated or how they were operated by local officials. Examining the conflicts and debates with regards to play and recreation between local residents and reformers is a way to glean some of the greater issues at stake during the Progressive era. When people asked who should be in charge of urban development, child care, and recreation, they were grappling with deeply divisive social tensions and growing gaps in a diversifying society. Examining Connecticut newspapers from over a century ago gives us a longer perspective on why play matters and how it came be politicized at local and national levels. 1909 Jane Addams, a pioneering social reformer in Chicago, publishes The Spirit of Youth and the City Streets (New York: Macmillan, 1909). History is often written by—and for—adults. Researching these topics will enable you to get a better sense of what it was like to be a child, and how that experience was cultivated and controlled over a hundred years ago. In The Bridgeport Evening Farmer there are sections entitled “Woman’s Home Page” and “The Woman’s Sphere.” These are great places to begin searches on women’s political issues and commentary on home and family life. “Playground movement” and “playground association” will generate a considerable number of articles. With this term, you will see how people in Connecticut read about local developments with parks and playgrounds and areas for play throughout the country. Locally, searching “Norwich playground association” will provide the best coverage for how playgrounds developed in that town. The Bridgeport Evening Farmer also has a section entitled “For the Young People” with guidance for play and recreational activities. In order to better understand why children’s play came to be such an acute issue, searches on “child labor” and “labor laws” will provide insight. Children were not always a protected class; many worked at the start of the 20th century and continued to work for wages for years. Baldwin, Peter. Domesticating the Street: The Reform of Public Space in Hartford, 1850-1930. Columbus: Ohio State University Press, 1999. Belanger, Elizabeth. “The Neighborhood Ideal: Local Planning Practices in Progressive-era Women’s Clubs.” Journal of Planning History 8:87 (2009). Goodman, Cary. Choosing Sides: Playground and Street Life on the Lower East Side. New York: Schocken Books, 1979. Knapp, Richard F. and Charles E. Hartsoe. Play for America: The National Recreation Association, 1906-1965. Arlington: National Recreation and Park Association, 1979. Rainwater, Clarence E. The Play Movement in the United States. Chicago: University of Chicago Press, 1922. Riess, Steven A. City Games: The Evolution of American Urban Society and the Rise of Sports. Urbana and Chicago: University of Illinois Press, 1996. Rosenzweig, Roy. Eight Hours for What We Will: Works and Leisure in an Industrial City, 1870-1920. New York: Cambridge University Press, 1985. Sessoms, H. Douglas. Eight Decades of Leadership Development. Arlington, VA: National Recreation and Park Association, 1993. Valentine, Deborah. “Playing Progressively? Race, Reform, and Playful Pedagogies in the Origins of Philadelphia’s Starr Garden Recreation Park, 1857-1904” in Children and Youth During the Gilded Age and Progressive Era, ed. James Marten (New York: New York University Press, 2014).